So here we are – another year, another Fall album. When I first saw this one advertised, I thought it was one of those semi-official compilations that seem to appear just as frequently as actual studio albums. The title could easily have been generated by a computer program that picks random words to come up with possible names for Fall albums, and the cover art looks as if it has been deliberately designed to resemble the albums of the early 90s ("Extricate"/"Shift Work"/"Code Selfish"). However, I soon discovered that it contains completely new material, including a few surprises. 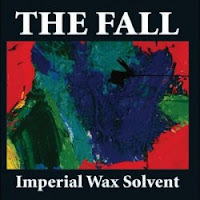 At first, it seems to be following the same pattern as the last few albums: totally forgettable opening song does nothing to instil hope, but then tracks 2 and 3 blow you away with classic Fall riffs and Mark E. Smith spitting out the words in his inimitable style. So we appear to be in familiar territory, until track 3, "50 Year Old Man", gives way to a strange banjo instrumental. A quick glance at the stereo reveals that this is not the next track, but "50 Year Old Man" is actually 12 minutes long and split into four distinct sections. Yes, you heard me correctly – The Fall go prog rock! It has been suggested that the four parts symbolise each decade of the band's career, although I’m not sure which era the banjo is supposed to represent. More surprises follow with the next song, "I've Been Duped". Again, it starts off like classic Fall, until the vocals kick in but it's not Mark, it's his wife (and keyboard player) Eleni Poulou. Once you get past the shock of a Fall song without MES, this one is very effective and is slightly reminiscent of the Slits, or possibly Kleenex/Liliput. The cover of the Groundhogs' "Strangetown" doesn't quite work, mainly because it appears to be skipping all the way through. I inspect the CD for dust or scratches, then wonder if I have a duff copy before a quick read of the unofficial Fall website tells me that it's supposed to sound like that. Now I know I listen to some pretty strange music but even I can't quite see the logic in producing a CD so that it sounds like it's faulty. The last half of the album contains a sequence of great tracks, in particular "Is This New" where the lyrics and vocal delivery remind me of mid-80s Fall. While nobody would deny that Mark E. Smith's voice is instantly recognisable on any track from the past 30 years, I do think that there are noticeable differences when you contrast recent vocals with those from early Fall songs; I guess he just sounds older and more world-weary now. But on "Is This New", his voice sounds much fresher and it brings back happy memories of my first encounter with the band during my teenage years. After just a couple of listens, I found that I was enjoying this album more than anything they've released in the last 10 years, so if you're a fan of classic Fall but not familiar with the recent releases, this would be a good place to start. Hey this is a very good review, it's made me want to go out and get this - and i'd say i was an old fan who's lost touch with MES recently - but this sounds like it has some great stuff on it. Particularly the banjo!! MES is a genius and i love your line about the random title generator! Very true!